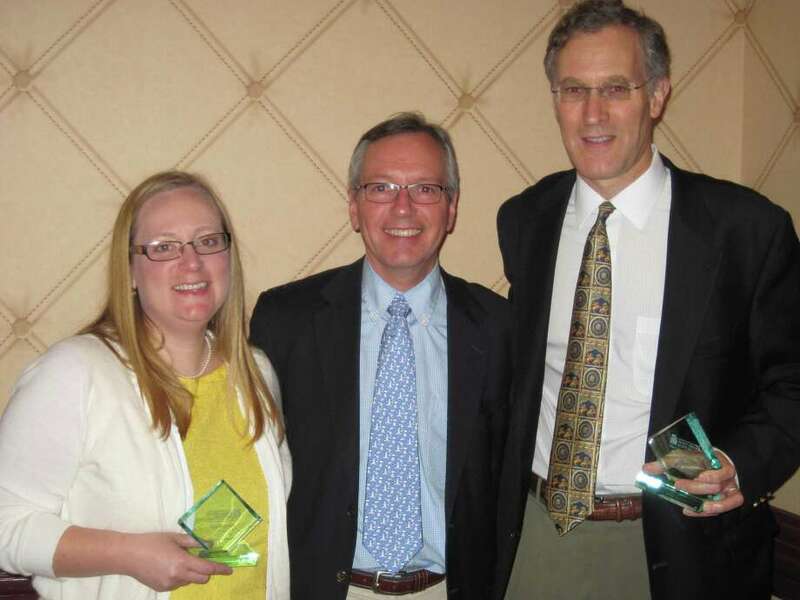 Family Centers' board member Carl Goodnow, of Darien, and staff member Katey Smith, of Norwalk, were recognized as Family Champions by the Connecticut Council of Family Service Agencies (CCFSA) for their outstanding commitment to improving the lives of families. At a ceremony held at the Trumbull Marriot on May 9, the CCFSA honored Goodnow, Smith and 30 other human services professionals and volunteers whose unselfish actions have helped strengthened families in Connecticut. Since joining the Family Centers Board of Directors in 2002, Goodnow has worked to ensure that children and families living in lower Fairfield County have access to the services they need to realize their potential. In addition to co-chairing the agency's Fostering Independence and Facilities committees, he sits on Family Centers' Governance Committee. In 2011, Goodnow also oversaw the design, construction and fundraising efforts associated with the creation of the Arch Street Preschool's new state-of-the-art playground. Smith has worked at Family Centers for six years. As the agency's reconnecting families coordinator, Smith goes above and beyond to reunite families torn apart because of abuse or neglect. She also coordinates Family Centers' trauma response team. Her accessibility, ability to lead and quick thinking has helped hundreds of families and communities during the most vulnerable of times. The Connecticut Council of Family Service Agencies, Inc., is a statewide network of independent, nonprofit, family service agencies that deliver services from over 90 offices located throughout the state of Connecticut. Member agencies are community-based, licensed by the State of Connecticut and nationally accredited. Governed by volunteer boards of directors drawn from their respective communities, Family Service Agencies have been effectively serving Connecticut families for more than 100 years. CCFSA employs a professional staff to assist in achieving its mission. Family Centers is a private, nonprofit organization offering education and human services to children, adults and families in Fairfield County. More than 1,300 professionals and trained volunteers work together to provide a wide range of responsive, innovative programs. A United Way and Community Fund of Darien partner agency, Family Centers is a member of the Connecticut Council of Family Service Agencies and the Alliance for Children and Families and is accredited by the Council on Accreditation and the National Association for the Education of Young Children. The agency is licensed by the State of Connecticut Department of Public Health. Visit www.familycenters.org for additional information.